We had a great lineup of sessions at Microsoft Ignite last week at Orlando. The entire session content is now available on-demand. 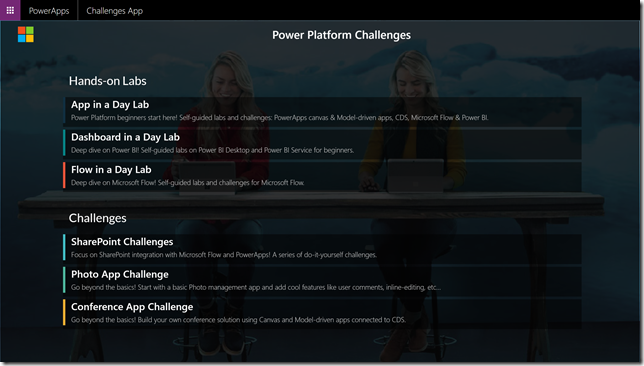 Here is a quick reference of the sessions relevant to PowerApps, Microsoft Flow & Common Data Service for Apps as part of the Microsoft Power platform. The shortcut for this blog for easy reference is https://aka.ms/pa/ignite2018. Join us to kick off Microsoft Ignite & Microsoft Envision at the Vision Keynote, where Microsoft CEO Satya Nadella takes the stage and highlights the need of Tech Intensity and outline Microsoft’s company strategy to empower every person and every organization on the planet to achieve more. Turn insight into action when you build business apps with PowerApps, Microsoft Power BI, and Microsoft Flow. This session gives you an overview of the power platform and how you can empower everyone to build apps that transform your business. We cover what we have in market today along with our roadmap and vision for the future. The way we build apps is fundamentally changing and PowerApps is leading the way. Hear from real customers including LEGO about how they are dramatically accelerating the way they build apps on a unified platform across Microsoft Office 365, Microsoft Dynamics 365, and standalone apps. Be the first to check out the top 10 latest capabilities that will help you go even faster pulling in your data, wherever it lives, leveraging over 200 connectors to cloud services, on-premises data, or even your custom-built connectors. The Common Data Service for Apps will make it even easier to bring it all together in a standard format through the extensible Common Data Model. All with the enterprise-grade security and manageability of PowerApps. Take your PowerApps capabilities to the next level with the latest in server-side logic on the Common Data Service for Apps, advanced expressions in canvas apps, using Flow to return values to apps, and more. Get inspired by this tour-de-force of hands-on demos and handy tips you can use to build business apps that will wow your users. This session will dive deep into the concepts needed to build applications on Common Data Service for Apps. Whether you leverage it for model-driven PowerApps solutions or in your custom built apps, we cover all the fundamentals like entity modelling, business rules, business processes, and include an introduction to extensibility options like Plugins, Virtual Entities, and more. Microsoft PowerApps provides a robust set of capabilities to build your business applications. However, if you reach the limits of in-box capabilities, what do you do next? ?In this session, we explore how to extend PowerApps with custom code using Azure Functions. Join this fast-paced overview and hear how to use Microsoft PowerApps and the Common Data Service for Apps to create rich and comprehensive apps, leveraging a custom data model, forms, and tools to guide users through your business processes. This session will take a deep dive into how you can modernize and enhance SharePoint Designer workflows with Microsoft Flow and approvals. We?ll take an up-close look at Microsoft Flow capabilities and how they map to SharePoint workflows, showcase real-life customer scenarios on Microsoft Flow, and discuss where the Flow + SharePoint integration is headed. Microsoft is modernizing business processes across productivity and business applications ? and now it's easier for every business to transform the way they work. Microsoft Flow is Microsoft?s workflow and business process management platform. It is the connective glue that helps end-users and developers alike for digital transformation, no matter what application they are using. In this session we cover this vision in detail, both in terms of what is available today, and a roadmap of what is coming in the future. Get a deep look into advanced techniques and expressions used to build complex and robust workflows with Microsoft Flow. ?This intermediate session will cover a number of topics such as error handling, working with complex types and lists, and looping. Finally, discover how you can take it up to Azure Logic Apps when it makes sense. Microsoft Visio, the leading diagramming application, enables enterprises to capture their business processes using its rich modelling capabilities. Create process diagrams from data or draw them on canvas and with a single click export the workflow to Microsoft Flow and automate it. With Visio?s sharing and commenting capabilities, collaborate with multiple stakeholders and arrive at a complete workflow in little time. See how we build a workflow in 10 minutes and take advantage of key capabilities of Microsoft Flow, including virtual buttons,?integration with Azure Cognitive Services, and more. Learn how you can build a solution in minutes that wouldn?t have been possible just a few years ago. As your company's adoption of PowerApps, Microsoft Flow and Common Data Service for Apps grows, so does your need?to protect your company's data, control access and monitor usage. In this presentation targeted at central IT, departmental and team admins, learn best practices for managing PowerApps and Microsoft Flow in your organization. ?Also discover our roadmap for administrative capabilities. PowerApps and Microsoft Flow make it possible to quickly customize Microsoft Office 365, Dynamics 365, and standalone apps without writing code ? but that doesn?t mean you?re limited to point and click. Learn how to go beyond the tooling to solve more sophisticated scenarios and empower citizen developers at every step of app development: build custom connectors to integrate directly with your own services; extend the server-side logic of the Common Data Service with code plugins, web hooks, and more; extend the user experience of model-driven apps with web resources and the new PowerApps Control Framework. The on-premises data gateway enables hybrid connectivity to on-premises data sources from a wide range of Microsoft services, including Power BI, PowerApps, Logic Apps, Microsoft Flow, Azure Analysis Services and Power Query Online. In this session we will provide an overview of the on-premises data gateway and tips and tricks for how to effectively use, troubleshoot and manage your gateways. We will also show demos of recently released Gateway capabilities as well as a sneak preview of features coming over the next few months. No-code and low-code applications have been essential tools in Microsoft SharePoint for a long time, but we?ve added many other new tools to your palette. We review the roadmap and best practices in our platform for creating business apps solutions (lists, Microsoft PowerApps, forms, Microsoft Flow). We also discuss the patterns to help transform customer solutions that still remain on premises and/or in legacy tool sets like InfoPath, SharePoint Designer or Access web apps. Join this session to learn about the Common Data Model (CDM). The CDM is an open-sourced definition of standard entities that represent commonly used concepts and activities across a variety of business and application domains. It provides unified data and semantics over a variety of entities spanning multiple industries including sales, service, and more. Data loaded into the common model can benefit from applications built on top of the platform without additional customization, including out-of-box insights and intelligent action. If needed, the CDM can be extended by partners and customers, ensuring custom entities and concepts can live and benefit alongside the standard schema. Join us for this intermediate, introductory session on the CDM to learn how. This day has it all, with two tracks running in parallel; from introductory to intermediate app building. The introductory track is an all-day hands-on lab that walks through: building a canvas-based PowerApp and a model-based PowerApp; creating and writing to a Common Data Service entity; and building a Microsoft Flow for approvals. In the intermediate/advanced track, a series of challenges are handed out that you can solve at your own pace. Proctors and product team experts guide the lab and are available to provide help. In this fast-paced session, we show you how our IT experts (and citizen developers too) built a simple, accessible, mobile-first news service that relays news, events, and important updates in a timely, streamlined manner to our worldwide field sellers. The news mobile app comes equipped with calendar integration, in-app feedback capability, and a search function too. This example showcases the ease and power of Microsoft PowerApps and how it allows for anyone?even those without coding experience?to create useful, impactful mobile apps easily. This is a session for SharePoint ?makers?. We?ll walk through the creation process of making one full-fledged solution using SharePoint. This will be a deep dive, including tips and tricks for building composite applications and solutions based on SharePoint?s numerous no-code extensibility mechanisms and will include Flows, PowerApps, WebParts, list-view row formatters and more. Learn how Microsoft Core Services Engineering & Operations (CSEO)?the experts who run the critical products and services that power Microsoft?are using Microsoft Flow to automate daily employee meeting and calendar management tasks at Microsoft. Match the uniqueness of your people and company with a talent solution that can flex to fit. Join us to learn how Microsoft Dynamics 365 for Talent can extend from OOTB best-practice capabilities, to a tailored fit using low-code custom built applications with PowerApps and the Common Data Service. PowerApps: Building PowerApps from scratch? Use Patch! Microsoft PowerApps does provide the out-of-box flexibility to build your own View and Edit forms which directly connect to your SharePoint list. While most of the time using the existing form design can be sufficient, however, sometimes you have the need to customize the form design from scratch. Thanks to the Patch function you can do just that. This session walks you through several examples of how a custom form can be built and, based on the controls selected, which formula is used to save the data back to SharePoint. Has your organization started embracing Microsoft PowerApps as the new standard for creating custom business forms and apps? PowerApps provides an easy interface that allows forms and apps to be customized for your requirements. When a solution demands advanced functionality, formulas can be utilized to conditionally hide or show fields, change colors, and perform a myriad of other dynamic tasks. In this session, learn how to get the most out of PowerApps, by mastering controls like Forms, Data Cards, and Galleries. By learning the properties, functions, and interactions of these controls, you will gain an understanding of the best way to customize your forms and apps to meet your business needs. Firstline workers?colleagues in manufacturing, retail, hospitality, and construction that are often mobile and first to engage with your customers?are critically important to an organization?s success. However, many of these employees can feel disconnected, underinformed, and disengaged from the rest of the company. Additionally, their productivity can be hampered by manually intensive and outdated tools from paper punch cards for clocking in to phone trees for trading shifts. In this interactive session, learn how you can deliver digital transformation solutions to your Firstline workforce by leveraging Office 365 technologies like Yammer, Microsoft Teams, Staffhub, and PowerApps. University of Oulu in Finland is creating innovation for the future, not only through science and study, but also by renewing its own internal processes. To start the digital transformation, they decided to take a few sample processes such as salary bonus requests, student presence tracking and student counseling services and try out how these processes can be transformed into modern digital counterparts using Microsoft Flow and PowerApps. Learn what went well, what didn?t work, the pitfalls to avoid and best practices to follow in order to renew processes for the modern workplace. Learn the limits and boundaries of Microsoft Flow and PowerApps and be prepared to excel in the digital transformation ahead. In this session we show how to use Azure to intake, process, analyze and store iOT data then visualize it in a PowerApp. Learn how to seamlessly combine the technologies to provide insights into data instantly. When building your PowerApp, you have the choice of building a canvas app or a model-driven app. In this session, we cover rules of thumb to use when deciding between model-driven or canvas apps, when you should use each, and how they can work together. Still not sure if Microsoft PowerApps and Flow are suitable successors for InfoPath Designer and SharePoint Designer? Then attend this session to see how an advanced InfoPath Designer form and SharePoint Designer workflow has not only been rebuilt but enhanced using PowerApps and Flow. In addition, see how PowerApps has made it easier than ever to leverage data from other platforms. For 13 years, InfoPath has been Microsoft's official method of creating business forms in SharePoint. Now that InfoPath has been phased out, PowerApps is the new way of creating no-code forms. In this session, Laura Rogers introduces how to create PowerApps, and specifically how to translate your common InfoPath form terminology into the new way in PowerApps. Through demos, this session gives you a solid understanding of how to build SharePoint web parts and Microsoft Teams tabs to meet your organization's various needs. Learn the easy steps to design your Microsoft PowerApps web part or tab, or mobile application, to follow company branding guidelines. Build a nice feedback app that works on mobile, in SharePoint as a web part, or in Teams as a tab. After the session you'll be in a much better position to answer questions like ?Can this-and-this be done with PowerApps?? or ?We need an Idea Vault web part to our SharePoint intranet front page. Is it going to be expensive?? Even if you are familiar with PowerApps, you'll learn great tips you can go and utilize after the session. Microsoft Flow is a service for automating workflow across the growing number of apps and SaaS services business users rely on that connect to data and work cross platform, and it?s sitting at the heart of the business process transformation in the modern workplace. Microsoft is investing enormously into Flow, making it the first inline tool for digital transformation and modernizing workplaces. Flow now has seamless integration and connectivity with the other stack of tools and services, whether they are from Microsoft or not, making it a vital tool for customizing and digitizing your modern workplace. Explore modern business applications using Microsoft Flow along with practical demos, the latest announcements, and updates. Microsoft Flow can be seen as a tool for power users but it can also be used by developers. This session illustrates how Flow is becoming an essential tool for developers by allowing them to shorten their development lifecycle and how they can extend existing applications in order to leverage tons of new features that Flow provides out of the box. See how to extend Flow by using the Microsoft Graph and by calling Azure functions, by creating custom connectors, how to implement advanced Flow approvals from your application, JSON and Flow, the new Common Data Services 2.0 integration, how to optimize your flow performance, how to make services flow and much more. Several patterns are also described. Logic Apps is an Azure cloud-based service that enables us to develop and deliver integration solutions with ease. It also helps us build, schedule, and automate processes as workflows so we can integrate apps, data, systems, and services across enterprises or organizations. However, Microsoft Flow is a SaaS offering, for automating workflows across the growing number of applications and SaaS services that business users rely on. We will help you chose the right product given that Flow was built using Logic Apps itself. We will illustrate the similarities between Logic Apps and Flow, and define the differences on the Whens, Hows and Wheres. By focusing on solving small problems that affect all users, you will not only save time and money, but more importantly, change negative users into positive evangelists. In this session Tracy and Loryan provide examples on how to use Microsoft Flow together with Teams, Planner, OneNote, OneDrive, SharePoint, Forms, Kaizala, and Outlook to truly realize business value. Scenarios covered include: ? Bringing communication methods together ? Managing your contacts, leads, and ideas ? Automating mundane tasks to save lots of time Once you understand how all the apps and services can work together to help you reach your full potential, you will wonder how you ever managed before. Creating modern SharePoint sites only takes a second but what if you want to customize or control that process? It can be a challenge to keep up with all the sites in an organization and can affect support and governance of a SharePoint environment. In this session, learn how to use Microsoft?s latest tools such as Site Designs, Site Scripts, PnP Site Provisioning, PowerApps and Flow to create a full site provisioning system with custom templates, custom branding, and easy approval before creation! Digital transformation is a necessity rather than a facility, and it's a result of changing the culture of work by making things easier and simpler. Office 365, including SharePoint Online provides digital tools that enable people in organizations to do their best work easily and efficiently, empowering teamwork and collaboration! Join Ahmad Najjar to see how you can leverage Microsoft Flow and PowerApps with powerful capabilities in SharePoint Online to level up your day-to-day work. Learn about creating automated workflows between a variety of Office 365 apps and services to get notifications, collect data, approvals, and more! The SharePoint Document ID service is great for adding a unique, trackable references to content. Engineers, information architects, knowledge managers, and process authors love metadata and often have a requirement for a specific structured naming convention. This session demonstrates how Microsoft Flow can be used to create an automatic document numbering system that applies a structured convention. In the session, learn how to combine managed metadata with user generated terms using switch cases, expressions and actions. Learn how to deal with trigger idiosyncrasies and simple error handling. You might not need an automatic numbering service but the principles you learn can be applied in other scenarios. In this session we show how existing Microsoft PowerApps and Microsoft Flow connectors use the Microsoft Graph and how to create your own. Learn how to make your own custom connector to access the Microsoft Graph from PowerApps and Flows.